Did you know that eating fish just once or twice a week reduces your chance of heart disease by 36%? Not only is fish good for your heart, it's also good for your brain. A recent study showed that pregnant women who ate 2/3 of a pound of fish a week had babies with a much higher IQ. Fish has also been shown in recent studies to help reduce depression. In this recipe, we're cooking fish the French way, fish en papillote. Cooking en papillote is a method in which you seal the food in a pouch of parchment paper and bake. The food steams in the oven in its own juices. It sounds fancy and looks very fancy, but it's really very easy. Sole is a very delicate fish with flat fillets, so it is well-suited to this technique. However, you may also use halibut, hake, flounder, salmon, tilapia, or other types of fish. You can also use a variety of vegetables and herbs — use what is in season and what you have on hand. Adding mushrooms or red bell pepper would be delicious. 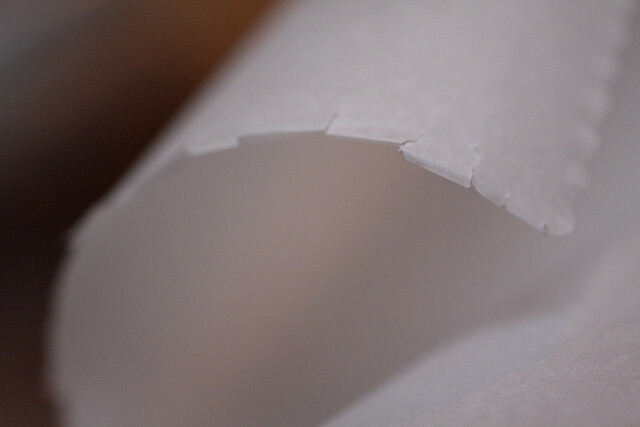 Traditionally the parchment paper is cut into a heart shape. You don't have to do it that way. It's easier just to fold it, which is how I have done it in this recipe. carrot matchsticks to a large bowl. 3. Rinse the zucchini and cut it into matchsticks as well. Add it to the bowl. 4. Peel and crush the garlic. Add to the bowl. 5. Add the olive oil, season to taste with sea salt and black pepper, and toss to combine. should be large enough to accommodate a fish fillet. 7. Unfold each piece of paper and place a fish fillet near the center fold. Season with sea salt and black pepper to taste. Arrange the vegetables on top of each fillet, dividing evenly. 8. Slice the lemon thinly and remove the seeds. 9. Top the vegetables with 2 lemon slices each, followed by 2 sprigs of thyme, 1/2 tablespoon of butter, and 1 tablespoon of white wine. 10. Fold the parchment paper tightly around the edges of the fish in 1/4- to 1/2-inch folds to create a half-moon shape. Make sure to press as you crimp and fold to seal the packets well, otherwise the steam will escape. 11. Arrange the packets on a baking sheet. 12. Bake until the fish is cooked, about 12 to 15 minutes. 13. To serve, cut open the packets (be careful of the steam that escapes) and serve directly in the parchment on a plate (or if you prefer, you can remove it before plating). Ooh, I forgot about fish en papillote! Thanks for the reminder! I notice you said you were doing fish and potatoes the french way- are potatoes part of the recipe? Sorry that was edited out — I forgot to edit it out of the excerpt. Great recipe. I eat fish weekly now, but before I discovered Weston Price I had given up fish because I thought it was too contaminated to eat. That was hard for me because fish has always been one of my favorite foods. I am not a huge fish fan,but I like canned tuna, so I was wondering does canned tuna count when you are talking about the benefits of fish? I buy wild planet brand that does not contain bpa, and boasts that it has lower levels of mercury. I have been following your blog for several months now and this is the first time I have commented. I just had to say this recipe was awesome! I made it last night for a dinner I hosted using salmon instead of sole and everyone loved it. It looked so fancy too, but it was easy to do! Thanks so much Ann Marie! We switched from ocean source foods (fish, seaweed etc.) to fresh water, mostly self caught only following the gigantic ‘dump’ of nuclear material in the wake of Japan’s meltdowns at Fukushima due to the earthquakes and tsunami so now, a wonderful dish like this will be substituted with a freshwater catch of trout, bass or even catfish (no salmon or fish caught where salmon reach freshwaters either since it means ocean source unwanted materials are more than likely present.) Our switch includes a change to high quality Flax, Olive and Hemp oils along with other vegetarian sources for the Omegas present in the fish oils. The general public is for the most part completely unaware of the reality of the truth that our oceans have become a sewer due to classified, declassified military and industrial release of all manner of toxic materials in our oceans. Would you like to learn more? Did you know that since the nuclear age we all have detectable Plutonium in our urine (type in Plutonium urinalysis Marshall Islands in google) and now the oceans are radioactively speaking ‘hotter’ than they have been since the beginning of the nuclear testing in them? Sadly, unless you have access to the assay equipment of institutions or commercial labs you have no way of knowing if the fresh ocean source fish or crustacean (likely carrying the highest amounts due to being a ‘bottom feeder) carries the ‘hot dose’ that results in the ‘oddball’ cancer within 3 to 15 maybe 20 years of eating it-including the mainstream ones such as colon or breast. Asian countries know they are seeing cancer rates they did not see 30 + years ago and many Japanese are fearful of their seafoods with good reason. Wow, what an excellent recipe! We had it tonight – fantastic! Thanks so much.